The classics never go out of style, especially when it comes to cake flavors. This light and fluffy classic white cake with whipped vanilla buttercream should be a staple in everyone’s kitchen. 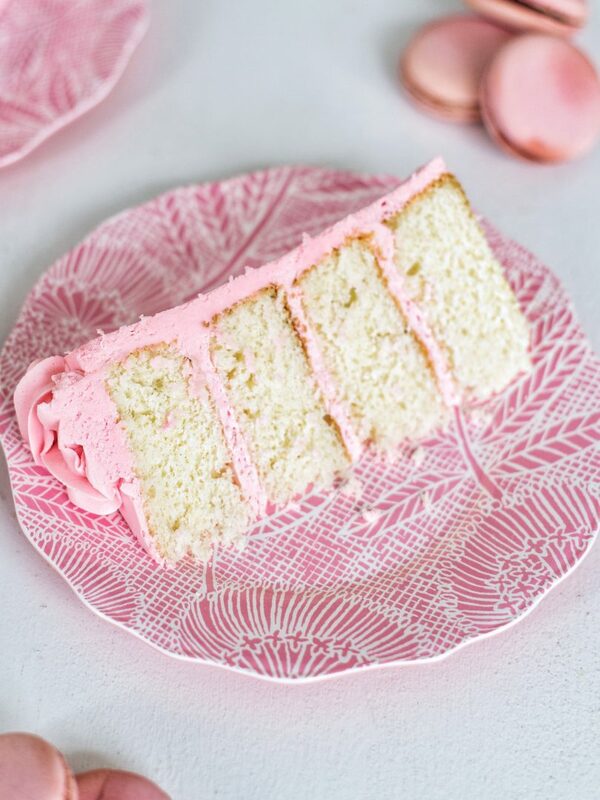 This classic white cake with vanilla buttercream was my very first post on Cake by Courtney. It was two and a half years ago right after Avery turned 2. I remember asking her about what she wanted for her birthday and she never talked about toys. 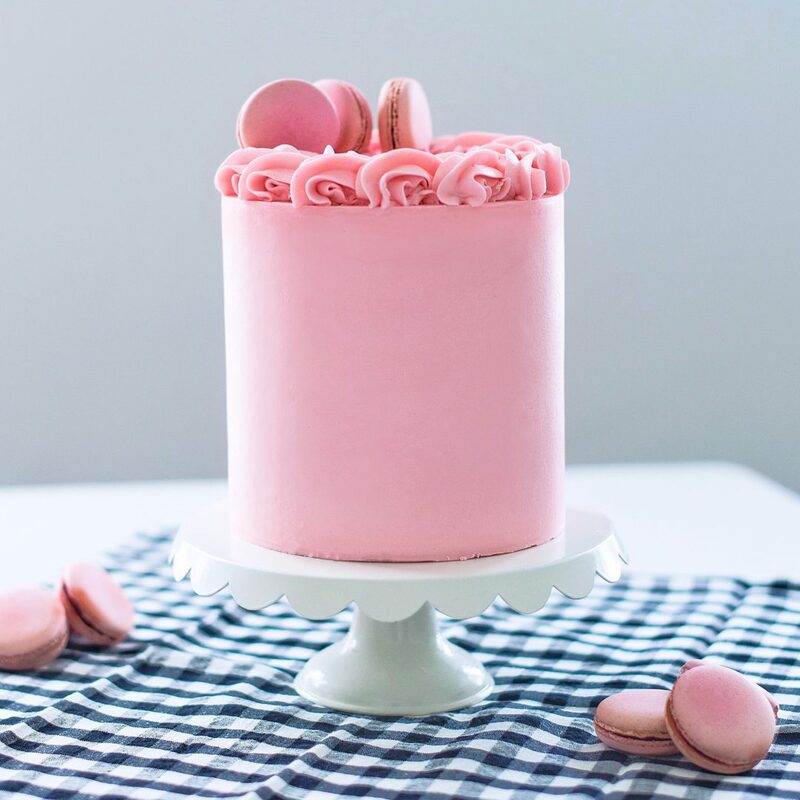 All she requested was a pink birthday with pink cake (clearly thinking about only the important things!). So, that’s exactly what she got! 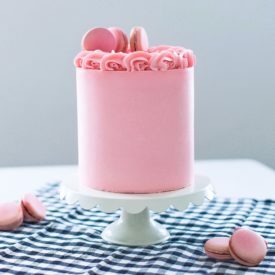 Pink decorations, pink clothes, pink presents, and a pink cake. The original recipe I used for Avery’s cake was from Sweetapolita. It’s a great basic vanilla cake but it was always coming out a little dry for me – not matter how carefully I watched the layers as they baked. So, over the last year or so, I’ve been testing out other white cake recipes and finally developed one I absolutely love. I tried to mimic my cake after the flavor of a white box cake mix, which I grew up on and loved as a child. This cake is tender and fluffy, and holds a subtle and kind of sweet vanilla flavor, thanks to the use of clear vanilla extract instead of pure vanilla extract. As you make this cake, it’s important to remember not to over mix the batter. Over mixing any cake batter is one of the main reasons it sinks while baking. Also take a look at your baking powder to make sure it’s fresh. This cake relies on a good amount of baking powder to help it rise. If your baking powder is more than 6 months old, throw it away and grab a new container. 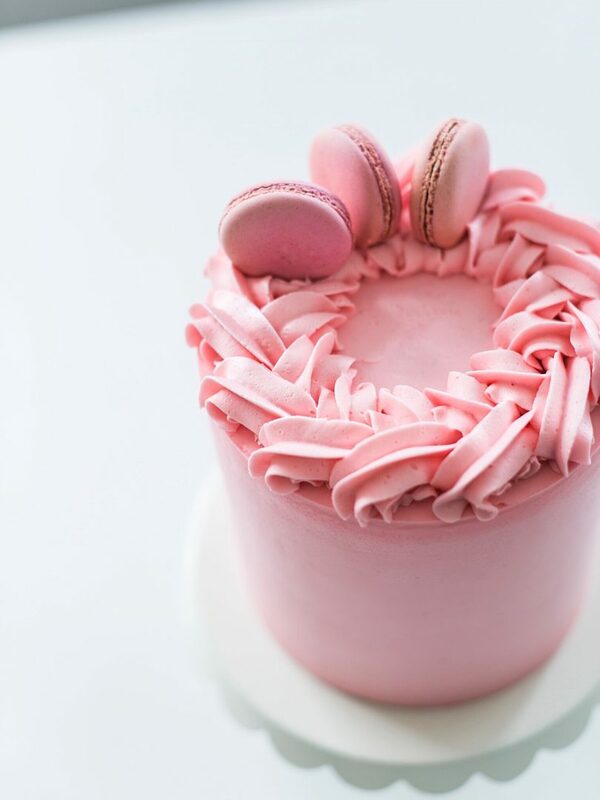 Following these 5 little steps is a game changer to your buttercream! The texture becomes so much lighter and silkier. The color also lightens up, which is nice if you’re trying to achieve a nearly white buttercream. This classic white cake is a great base for so many frosting and filling flavors too. I’ve paired it with raspberry, strawberry, lemon, chocolate… the list is endless. 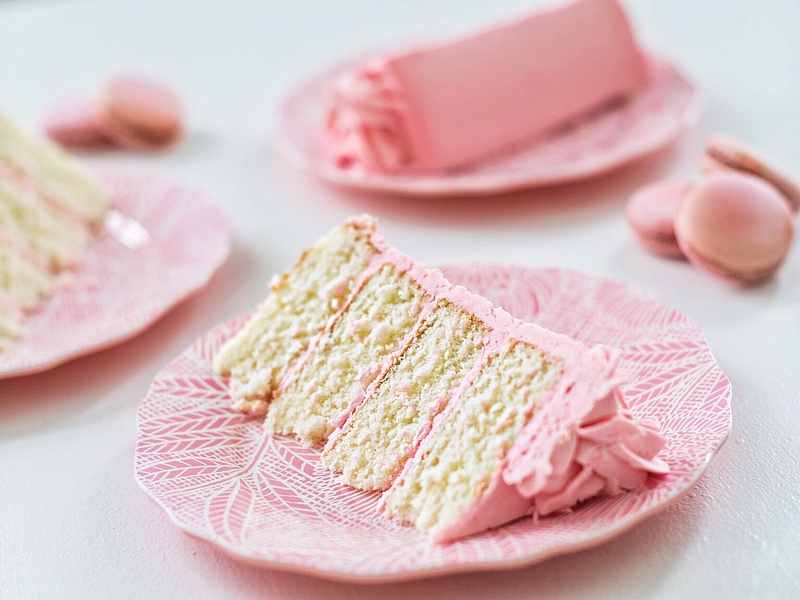 Tender and fluffy white cake layers with a whipped vanilla buttercream. Using a kitchen scale, divide batter evenly among your pans (about 12 ounces of batter in each of the 6-inch pans and about 16 ounces of batter in each of the 8-inch pans), spreading evenly with a small offset palette knife. In the bowl of a stand mixer fitted with a paddle attachment, cream the butter for about 2 minutes. This will soften the butter without it having to be warm. With the mixer on low speed, gradually add the sifted powdered sugar, one cup at a time, mixing a little in between each addition. With mixer on medium speed, add whipping cream, vanilla and salt. Turn the mixer to medium-high speed and beat for an additional 5 to 7 minutes. The frosting will become lighter in color and texture. Before spreading on your cake, spend a couple minutes mixing the buttercream by hand with a wooden spoon to push out the air pockets. Place the first cake layer, top side up. For the 6-inch cake, add about 1/2 cup of frosting on the cake layer. For the 8-inch version, add about 1 cup of frosting. Spread over the cake layer as evenly as possible. Make sure to get eye level with the cake to ensure the frosting is spread evenly over the cake. Apply a thin coat of frosting around the entire cake to lock in the crumbs. Freeze for about 10 minutes. I did three 6-inch cake layers and baked for a little longer. This looks amazing! I am so excited to make it for my daughter first birthday in a couple weeks 🙂 How come you’d bake three 6-inch cakes longer than three 8-inch cakes? Thank you! There’s a little bit more batter in the smaller pans. So are you saying you did this same recipe in three 6” cake pans and used all of the batter? Do you recommend that over doing three 8” pans? I recommend doing the three 8″ pans or four 6″ pans. I had leftover batter when I first did this recipe. The layers will be thinner. I think it would be better as two 9-inch pans or add an extra half of the recipe to do three 9-inch pans. I made …or tried to make this cake; followed the recipe carefully…. my cakes came out dry; and the frosting wasn’t sticking to the cakes; it would just peal off and started to crumble my cakes the only way I found it would kind of stay was If I pressed it with my fingers; I gave up and made a frosting I have made in past that would glide easily…. I’m not sure what went wrong. BUT I tried and I think flavors were good … just to dry. Usually when a cake is dry and crumbly, it’s been overbaked. Our ovens are all very different, and there’s a chance yours runs a little hot and needed a couple minutes less for bake time. Next time, check the cake after 80% of the baking time has past. When you pull a toothpick out of the center, there should be a few moist crumbs on it. So excited to try this soon! Have you ever used a basic whipped cream as a filling? Hi how are you? I have a question 2 actually. Do you have any recipes for 10 inch pans or 12 inch? Also if I made the classic white cake do I just double it for a 10 inch or triple it? Depends on how many layers you want to make for those size cakes. My buttercream always becomes very delicate with lots of air pockets when I add heavy whipping cream. Despite mixing it afterwards by hand, the air pockets for the most part remain so I never get a smooth finish like yours. Any thoughts? Are you sifting your powdered sugar too? That’s essential. Try using less cream, but still beating for 5 minutes and still mixing by hand. Hello! Recipe looks amazing ! I was wondering, do I have to double or triple the recipe to make three 10 inch layers? And how long would I have to bake that for? Yes, I would double the recipe for 10-inch layers. I’m not exactly sure on the bake time. I’d start with an extra five minutes and continue to add 3 minutes after that if it needs more time. Hi Couetney I absolutely love your recipes! Do you think it would be ok to make your buttercream the day before I decorate and keep refrigerated? If so would I need to let it sit at room temperature before I use it? Thanks!! Thank you! Yes you can totally make the buttercream ahead of time and refrigerate it covered in a bowl. Let it get back to room temp. before you use it and rebeat it in the mixer too. This recipe is amazing! It turns out perfect every time! I was wondering how many recipes I would need in order to make 4x8inch layers. Thanks! Ps – love your videos and your recipes are so well written! Hi! I’m so sorry to hear that – so it could have been a few things: old baking powder (I don’t use anything over 6 months old) or you might have over mixed the batter (low speed just until the flour is incorporated), or your oven temperature is off from what the screen is telling you (use an oven thermometer to check the internal temperature). I was wondering if this cake will do well as a sheet cake or to carve? I haven’t tried it that way but I think it would work as a sheet cake. It’s light and fluffy so I’m not sure it’s a great one to carve with. Can this be made into 3 8″ rounds? Also if I wanted to make this more almond flavor. Would i replace all the vanilla or do 2tsp almond extract, 1 tsp vanilla? Yes, my cakes can switch between 4, 6-inch pans or 3, 8-inch pans. You might need to reduce the baking time a little. Keep an eye on it toward the end. And yes, split the vanilla and almond extract. I found your site and just can’t stay away! I am learning so much and your cakes are incredible. 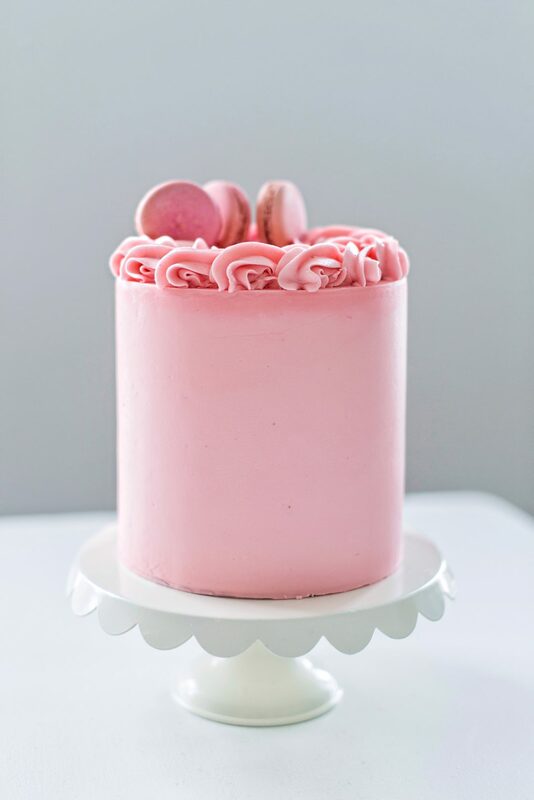 Can your classic buttercream be used under fondant? If so, does it need to stay refrigerated? Thanks so much for sharing your incredible talent. Hi! I’m not exactly sure because I’ve never tried fondant over my buttercream. I would say yes, if you take out of the heavy cream from my recipe so it’s a little more stable. Do you find that your cakes turn out better when you use cake flour versus all purpose flour? I think it depends on recipe. It’s best to use what’s called for. What kind of color dye do you use for the buttercream? Also, when do you recommend adding that to the recipe? I like Americolor food gels and I add it at the end. Can I use whole milk instead of buttermilk for this recipe? I prefer buttermilk, but you can use whole milk. This is the first recipe of yours I have tried. The first time the cakes baked flat, though still delicious. I lowered my oven temp because I always thought it was a little hot.. what a difference! They were thick and perfect! I used your frosting method as well and am so happy with the results! I have your acrylic discs in the way! Can’t wait to try more of your recipes!